About four in 10 Americans approve of the job Donald Trump is doing as president, and that figure has not changed materially over the past four months. Accounting for a small number of those without an opinion, a little less than six in 10 disapprove. That too has not changed. The range of presidential approval ratings in Gallup's history stretches from a high of 90% (George W. Bush after 9/11) to a minimum of 22% (Harry Truman in 1952). The average is 53%. Trump is performing well below average, worse now than all other newly elected presidents at this point in their first year. At roughly the same time in July of their first years in office, Dwight Eisenhower was at 69% approval, John Kennedy at 75%, Richard Nixon at 58%, Jimmy Carter at 62%, Ronald Reagan at 60%, George H.W. Bush at 66%, Bill Clinton at 45%, George W. Bush at 57% and Barack Obama at 58%. A recent Washington Post piece included this quote: "What remains remarkable about the past six months is how durable the president's support has been among Republicans. Despite objectively losing almost every news cycle since he took office, Trump's approval rating among GOP voters is still at the same level in Gallup's tracking polls as George H.W. Bush and Ronald Reagan at this point in their presidencies." While Trump receives high ratings among Republicans, as the Post notes, he gets extremely low, single-digit approval ratings from Democrats and only about one-third approval from independents. That accounts for his historically low overall approval ratings among newly elected presidents in the summer of their first year. In times past, things were not so polarized, and presidents received more charitable ratings among those who didn't identify with the president's party. Trump's support has been stable. There has been little meaningful change since March, with his weekly averages ranging narrowly between 37% and 42%. This stability may result at least partly from the increased polarization mentioned above, with both Republicans and Democrats firmly entrenched in their opinions. Trump was at 38% approval for the week ending July 9, and is at 39% for the three-day period of July 11-13. He is well above the 20% low range reached by five presidents in modern polling history: Truman, Nixon, Carter, George H.W. Bush and George W. Bush. The portrait of those who approve of Trump's performance as president is pretty straightforward. About 76% of approvers are Republicans or Republican-leaning independents, which means that other demographic and geographic characteristics of Trump's support follow the general picture of those who identify as Republicans in our society today. These include whites, those who are highly religious, men and older Americans. Dante Chinni recently reviewed Gallup data in the context of work done by the American Communities Project at George Washington University. This project categorizes all of the nation's counties into like-minded affinity groups. Trump's support is highest in counties classified as Evangelical Hubs, Working Class Country and Rural Middle America. By contrast, his support is lowest in Big Cities, Urban Suburbs, Hispanic Centers and College Towns. People can disapprove of a president for a number of reasons. At this point in the first year of his presidency, those who disapproved of Barack Obama focused mainly on their disagreement with his policy actions and positions on issues. Now, those who disapprove of Trump focus primarily on his personality and character as the reasons for their disapprobation. I think it's clear that Trump's unconventional style, willingness to defy convention and to say things normal politicians don't say helped convince voters in last year's campaign to vote for him. Many may have thought he would change his ways once he entered the Oval Office. But that hasn't occurred. About two-thirds of those who disapprove of Trump talk about his character, personal qualities and overall qualifications as their reasons for holding those attitudes. While Trump's unconventional style may still be working to his benefit among those who like him, that's not evident in their self-reported explanations for approving of the job he is doing as president. Mentions of his character and personality are much less frequent among his approvers than among his disapprovers. Approvers tend to talk about Trump's presidency more generally or mention issues. Trump clearly was cognizant of Americans' great distrust of government in his presidential campaign, and his promises to change the situation ("drain the swamp") helped him get elected. But we see no signs so far that Americans' attitudes toward government have changed for the better after his election. Over the past two months, dysfunctional government has been among the most frequently mentioned issues when we ask Americans to name the most important problem facing the nation. Further, although Republicans control both houses, Congress approval remains low among Republicans (28% in July) and, as a consequence, low among the population as a whole. One important fact about Trump is the degree to which some of his positions on the issues actually resonate with the public -- including spending a great deal of money on the nation's infrastructure, trying to bring manufacturing jobs back from overseas, helping veterans and creating more jobs in general. In fact, our new data show that Trump gets higher ratings for his stance on issues than for having the personality and qualities expected of a president. That's a flip from what is normal. Usually, presidents score higher on the personality and qualities dimension than on issues. Trump, at least as measured by his job approval ratings, has not yet been able to maximize any advantage he might obtain from pushing policy positions that resonate with the public. Trump has shrewdly taken advantage of the pre-existing distrust of the news media among conservatives and Republicans (as did Roger Ailes before him with his creation of the Fox News Network) and has made the demonization of the media a big part of his public persona in office. On this front, our data show that Americans are divided -- about as many take Trump's side in this "battle with the media" as take the media's side. The division is along partisan lines. Further, new data show that about six in 10 Americans still say the news media report news stories that are inaccurate. Many continue to say the media favor the Democratic Party over the Republican Party. It is possible that Trump will change his personal style or bring about major breakthroughs on either the domestic or foreign scene, and, as a result, improve his image in the American public's eyes. Or, revelations relating to Russia or other issues now under active investigation by the special prosecutor or Congress will cause his ratings to drop further. I think the probability is highest, however, that Trump's approval ratings in this highly polarized environment will remain relatively stable going forward. Track the "will" of the people -- every day. Americans who disapprove of Trump's job performance mainly cite personality and character issues as the reason for their negative views. By contrast, in July 2009, those who disapproved of Obama mainly cited policy disagreements. After five months in office, majority support for President Donald Trump has retreated to rural areas, as Americans living in suburbs have shifted away from him, and urban centers remain out of reach. 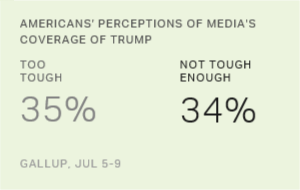 Americans are split as to whether the media are too tough or not tough enough on President Donald Trump. Historically, presidents' approval ratings have not increased after State of the Union addresses, but there have been modest upticks after the past three.